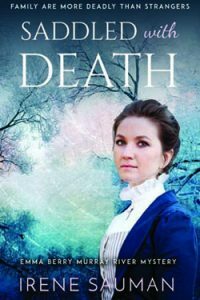 In this novella series prequel, Emma Haythorne (unmarried, but soon to meet Sam Berry) is staying at neighbouring Nettifield pastoral station, on the Murray, to help her friend Bea Macdonald look after the household comprising her three brothers, father George and terminally ill mother, Martha. Family visitors arrive by paddle steamer, on their way home from a trip to England. Shortly into their visit, George Macdonald’s half-brother, Vernon Appleton, is found dead in the stable. Emma is charged by the dying woman with finding out who killed him, but who, apart from her husband, had a motive? And will she still be welcome at Nettifield after she unmasks the killer? An Emma Berry Murray River Australia cozy mystery.